We have many ties with others through birth and our families. We find we are connected with one another by bonds that are not of our own making. Like the links we have with our families into which we are born or adopted, our relationships with other members of the Body of Christ are also given to us. These relationships are a reality we find rather than one we construct, for they are not products of our acts of willing. Though we discern the reality of these given birth and baptismal connections between us, we easily fall into patterns of thought that suggest otherwise. When asked who we are, we often answer in ways that ignore these received relationships. We forget that, especially after Baptism, who we are can never rightly be described without also referring to whom we are for. Acts 2 describes the post-resurrection community as having four shared attributes : common worship, common practices, common goods, and common witness. * Members of this community could share “all things” because they already shared the most important thing, the beauty of new life in the risen Jesus. 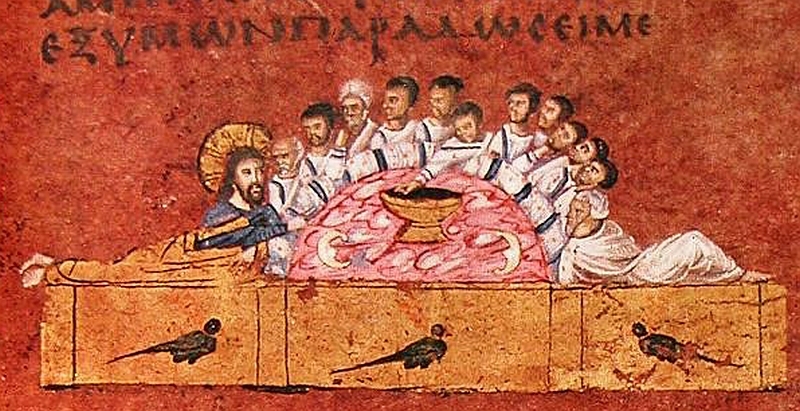 The Rossano Gospels depict Jesus with the disciples at the last supper, reclining in ancient mediterranean style. The image of circular fellowship applies equally to their life together after the resurrection and ascension. They shared their lives at the table of Eucharist and at tables of fellowship, which became visible symbols of everything else they shared. Judas is shown leaning out from the pattern of this circle, fulfilling Jesus’ prediction about the one who would dip in the bowl after him. Judas’ stance mirrors his refusal to share the common purse with which he has been entrusted, and his disinclination to share common worship and common witness to Jesus’ power among them. Common beauty is within us and around us. Seeing each other as joined in the risen Lord is directly correlated with seeing the risen Lord in each other. By sharing union with him, and through discerning his beauty in one another, we are more likely to share everything else. The image above is from the Rossano Gospels, 6th century A.D. *Robert W. Wall offers this insight. We live in a world filled with “data.” Disconnected bits of information, especially in great quantity, overwhelm our ability to see and to think. Accumulating additional data or more information does not produce knowledge. Knowledge has to do with seeing the connections between bits of information. When we see the connections, we begin to see a picture, we begin to hear a story, and we gain understanding as well as wisdom. The unrecognized fellow traveler on the road to Emmaus asks, ‘what are all these things you are talking about?’ The answer he receives from the other two on the road amounts to giving him information. But his question was pointed toward understanding, especially in relation to ‘the big picture.’ What do ‘all these things’ have to do with what God has been up to, all along? Here is a basic Christian truth that we find in the Emmaus Road story: Things take on meaning in relation to the risen Jesus. It happens when we see events in our lives in relation to him. It happens also with things like bread and wine as we gather at table. And it happens with people like you and me as we gather in community. Jesus helps our perception on the road to Emmaus, and reveals something even more profound at the inn. This ‘inn,’ unlike the one where he was born, has many rooms, many mansions. When we see things like past events and the bread in relation to him, we discern more about what they are, and what they can become. When we see ourselves in relation to him, we better discern who we really are, and who we are called to be. Prayerfully, we can look around, between things, and within. We can look for the connections. When we do, we see and discern. We see more because we see more wholly. Then we see the holy. 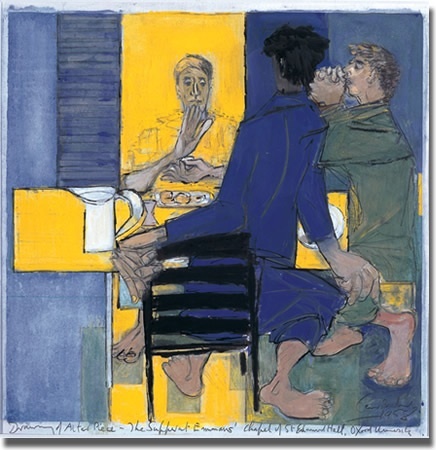 The above painting, Supper at Emmaus (1958), is by Ceri Richards, and is used by permission from the Trustees of the Methodist Modern Art Collection (UK). The penciled notation at the base of this guache painting on paper suggests that it was intended as a study for an altarpiece painting for the chapel of St. Edmund Hall (or College, at Oxford, England). The Emmaus story can be found in Luke 24:13-35. An early Christian bishop, St. Irenaeus, left a saying dear to many: the glory of God is the human person fully alive. We are called to be fully alive, and to realize God’s glory in our own being. To be fully alive is a gift rather than an attainment, and means experiencing an integration of body and mind, as well as heart and spirit. Such a synthesis is uniquely human. Angels lack bodies, and animals lack God’s breath or spirit within them.